Hermann and Agnes Seifried (Seifried Estate) are the pioneers of the modern winemaking industry in the Nelson region and their contribution to the success of the industry here goes far beyond producing their own wines; they have shared knowledge and resources with other local producers to help Nelson become a top wine producing region. Over the last forty years, the Seifried family have developed a significant wine business producing a wide range of quality but very affordable wines that are sold throughout New Zealand, including at Fresh Choice Nelson where the Grocer has a wide range of Seifried wines for you to choose from. An overarching philosophy of this family owned winery has been to produce quality wines that are affordable, and the Grocer loves that because he knows he can stock quality wines starting at just $10 for their Rabbit Island range, from about $15 for the Seifried Estate range and over $25 for the Seifried Winemaker’s Collection range. 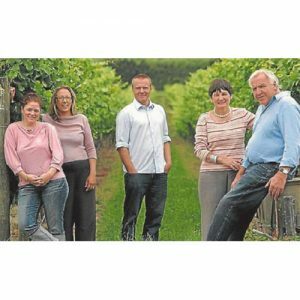 As with all businesses things change as it gets older and for the Seifried family this change has included all three of the Seifried children leaving home to gain qualifications and experience before returning to Nelson when they were ready to become part of this outstanding wine business. Chris and Heidi are winemakers while Anna uses her wine marketing degree to promote and market the family’s wines to the world. Even though Seifried Estate is the largest wine producer in the region they have a focus on producing quality wines as evidenced by the number of medals they win at wine shows around the world. The star wine show performer is the Seifried Winemaker’s Collection Sweet Agnes Riesling, it has been awarded the top trophy for sweet wines at the Decanter World wine Awards multiple times, and has been named Best Sweet Wine in the World no less than six times. With accolades like this you know you can rely on Seifried Estate wines delivering outstanding quality and value for money. Big thanks to our wine expert and guest Blogger, Neil Hodgson, for this blog article.